Looking for a way to put your logo out there time and again in a big way? 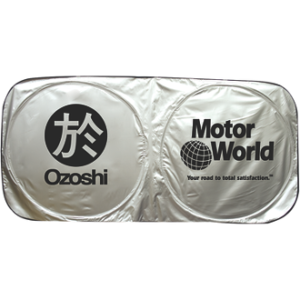 Auto sun shades are a great way to put your logo on something people use year round. Imprint area is 16″ diameter on the right and left sides of the sun shade. Pops open with a unique spring like action, folds down easily for storage. Made of light, reflective material to keep the car or truck cool. Silver front, black back. Min is 50 at 5.82 ea, 100 at 5.37, 250 at 4.99 ea. Set up is 50.00. Item BCSS.